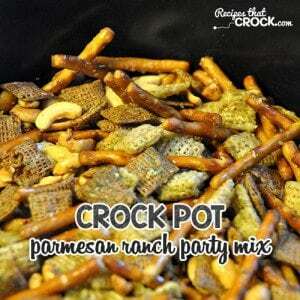 Crock Pot Parmesan Ranch Party Mix - Recipes That Crock! 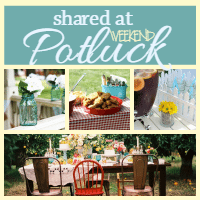 Michael and I were talking a week or so again about recipe ideas. It does me well to talk things over with him. As you know, Michael is a food lover. So it never fails that if I come up with an idea he has a tweak or two to make to it. So I might as well have his input from the start! I can’t take any credit for the initial thinking on this one because Michael had that “light bulb – I’ve got an idea” look on his face. He said, “Why can’t you make party mix with ranch dressing mix! 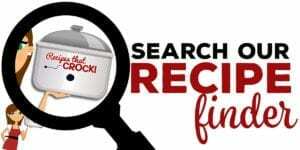 That would be awesome!” So I took a look at Cris’ Sweet & Salty Party Mix recipe to use as a cheat sheet of sorts…you know, cook times, base mixture, etc. and gave it a try! 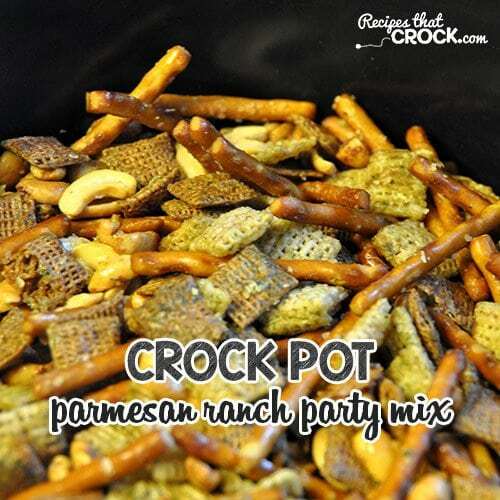 This Crock Pot Parmesan Ranch Party Mix was a HUGE hit at small group. It may have even been described as divine. In fact, we had such few leftovers on Sunday that Michael requested I make it again by Wednesday. It is that good…and addicting! Yum! 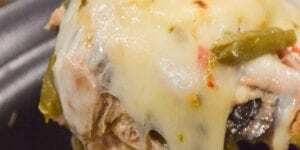 Now the parmesan was an afterthought. I was putting the box of butter back into the fridge when I saw my remaining parmesan wedge in the fridge. Hmmm…my light bulb went off! Grated parmesan! If you have been following along with my posts ever since I made this Crock Pot Chicken Alfredo, I have been all about the fresh grated parmesan. This seemed like a good place to add some in. Thankfully, I had just started the recipe, so I just added half on top, gave it a stir and then the other half and stirred it again. 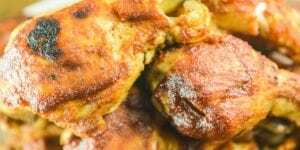 I combined these steps with the butter mixture just to save you some hassle. 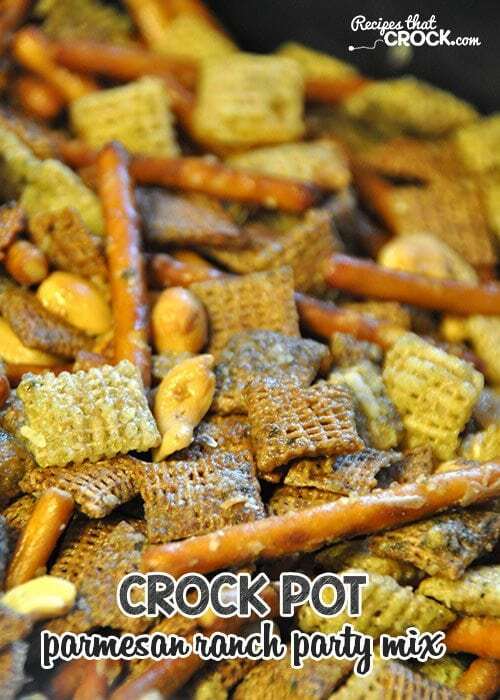 This Crock Pot Parmesan Ranch Party Mix was an instant hit! 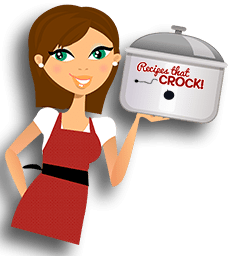 I made this in my Hamilton Beach Programmable Insulated Slow Cooker because it is my long-standing favorite…and I show favoritism when it comes to my crock pots. Your fav 6-quart slow cooker (or bigger) should do. With how much is in this one, I wouldn’t use any smaller than a 6 quart. I have a new Power Pressure Cooker XL.I have never used it am afraid I will ruin it,can I use this to make this? 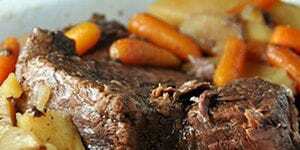 I am not familiar with the Power Pressure Cooker XL, so I can’t say for sure if it would work for this recipe or not. 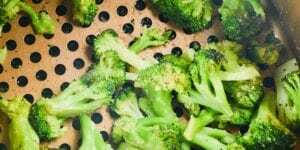 Do you cook for 2 hours on high or low? Cook it on high. Enjoy! Sorry about that! You are correct, it is 1/2 cup. 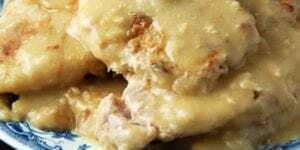 I have updated the recipe. I hope you enjoy it as much as we did!